Google has apparently been listening to what business customers want from a public cloud. On Tuesday the company announced that it will introduce Virtual Private Networking support in the first quarter of 2015. VPNs will let customers tie securely into [company]Google[/company] Cloud via the internet, and they are a key foundation of hybrid clouds that let customers keep some key applications and data under their control in-house while also relying on the public cloud for other workloads. Also new from Google: Direct peering promises a fast connection to Google’s network from 70 locations worldwide. And new carrier interconnects add Google cloud access from [company]Equinix[/company], [company]IX Reach[/company], [company]Level 3[/company], [company]Tata Communications[/company], [company]Telx[/company], [company]Verizon[/company] and [company]Zayo[/company] facilities around the world. To win risk-averse business customers, Google needed to offer something analogous to AWS Direct Connect or IBM SoftLayer’s Direct Link, which provide a dedicated physical connection from a company’s own servers to its public cloud of choice. Google now says it offers such direct links in 70 points-of-presence in 33 countries. The carrier interconnect will let customers running diverse cloud services — co-located at those facilities — access Google Cloud from those sites. For the many business customers that run several SaaS applications, carrier interconnect will come in handy, said Ihab Tarazi, CTO of Equinix in Redwood City, California. If a customer runs one company’s CRM, another’s SaaS-based ERP, and Google Apps, the fact that all those services flow through the same co-location center means better performance and easier management. Proximity is actually key in the cloud. Carrier hotels that run tons of different services are able to offer customers lower latency between all those services. Brian Stevens onstage at Google Cloud Platform. Before now, existing Google Apps shops had to access those applications via the same public IP network that supports YouTube and other Google consumer services. Now they’ll get dedicated capacity to that IP network and be able to burst up to 10G in 15 markets, Tarazi said. Equinix will also manage the public and private IP addresses, so there is no contention. Much of this networking progress comes courtesy of Google’s Andromeda software-defined networking infrastructure which powers the global network running Google search etc. and is now being rolled out — in its 1.5 release — to its cloud as well. Andromeda furnishes the virtual networking stack, routing tables, firewall and load balancers, said Janakiram. “With the October update, Andromeda now delivers twice the original performance. This will be the key differentiator for Google Cloud Platform,” he added. Google will also parlay its Kubernetes-Docker game plan by releasing an early test version of Google Container Engine, essentially a managed service for hosting and running Docker container applications. Google open-sourced Kubernetes, its Docker management capabilities, earlier this year in a bid to promulgate its take on container management to the world at large. 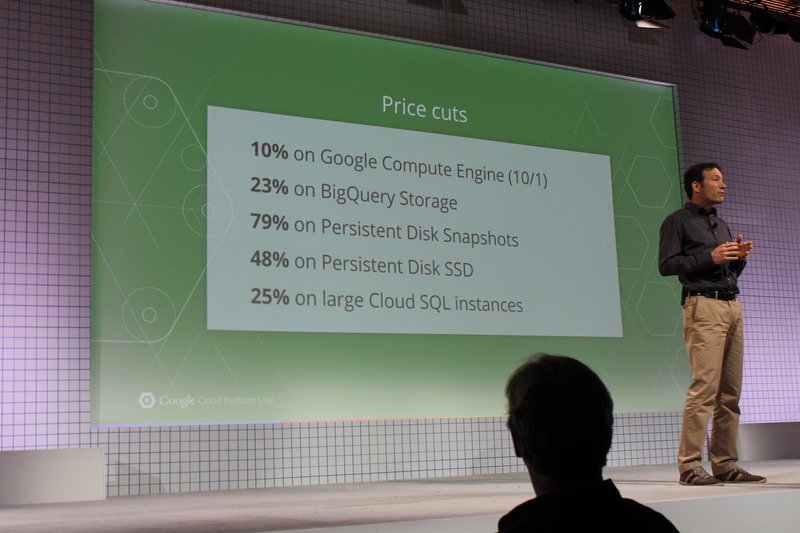 Price cuts are now table stakes at events like Tuesday’s Google Cloud Platform Live in San Francisco. Google said it’s cutting network egress charges by 47 percent, BigQuery storage by 23 percent and Persistent Disk SSD by 48 percent, among other cuts. For context, [company]Amazon[/company]’s AWS Re:Invent show is next week and the company will likely announce a whole other set of price cuts and service additions there. [company]Microsoft[/company] has said it will meet or beat price cuts on base services by competitors so there may be some action from that quarter as well. Google’s Tuesday event will be hosted by Greg DeMichillie, director of product management and will feature Brian Stevens, the former Red Hat CTO who is now Google VP of cloud platforms. My colleague Jonathan Vanian is attending the event. Of all the goodies Google is throwing out there, one really stands out to David Mytton, CEO of Server Density, and that is new official support Ubuntu on the Google Compute Engine. Ubuntu is a very popular flavor of Linux, most say the lions’ share of Linux instances running on Amazon Web Services run Ubuntu. Google now officially supports Ubuntu 14.04 LTS, 12.04 LTS and 14.10 releases. GCE had already supported Red Hat Enterprise Linux, Debian, CentOS, and SUSE Linux so Ubuntu was conspicuous by its absence from that list. 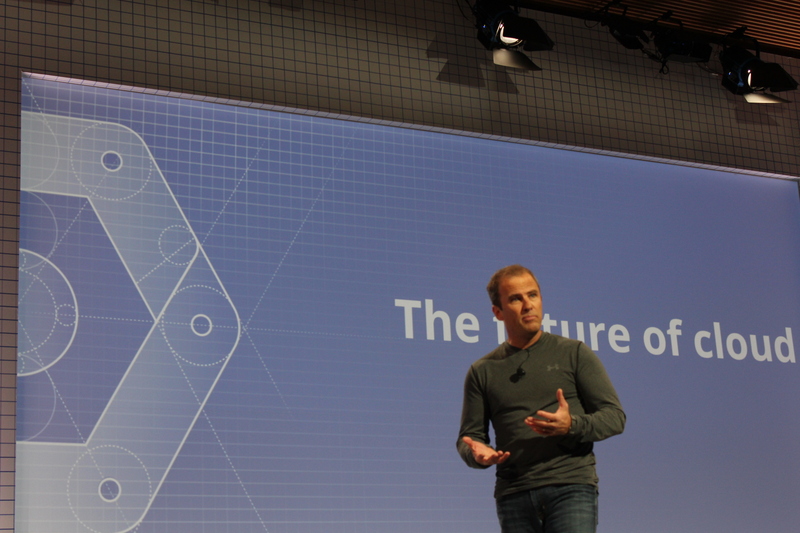 Google has made some big investments and some key hires, including new executives who can take on some of the public-facing roles thus far assumed by SVP and Google Fellow Urs Hölzle (pictured above). But before we get ahead of ourselves, remember that Amazon has an eight-year head start in this arena. Microsoft, with its deep pockets, is also making a big play, as are other legacy IT vendors. The public cloud market is potentially huge but also hotly contested. On Monday, [company]IDC[/company] estimated that the public cloud market is worth about $56.6 billion this year and will hit $127 billion by 2018, a 22.8 percent compound annual growth rate over five years. One thing seems clear about Google: Those who doubted this company’s desire to make its cloud a destination for business workloads had better think again. For some background, check out Demichillie’s appearance on Gigaom’s Structure Show podcast last year. The key missing enterprise feature in Google Cloud is actually enterprises sales. Without sales people on the ground Google doesn’t stand a chance. They failed to realize this back when it could still beat MSFT in the Google Docs battle against Office 365. They are now settling for midmarket leftovers. AWS has spent the last 3 years building a formidable on-the-ground sales force, that already has a firm grip at every F500 and well beyond. Google won’t be able to create the technological lead needed to force these enterprises to even consider them, while AWS and MS Azure are well aligned with what these CIOs expect to get, when working with a vendor that wants a piece such a critical part of their IT infrastructure.